Yum. Say it again because it's worth saying at least twice. Yum-yum. This popcorn is fantastic! I made it the other night on a whim while trying to figure out something different I could make for a snack for Jay's lunch. It is not caramel corn because it's not a thick chewy coating. 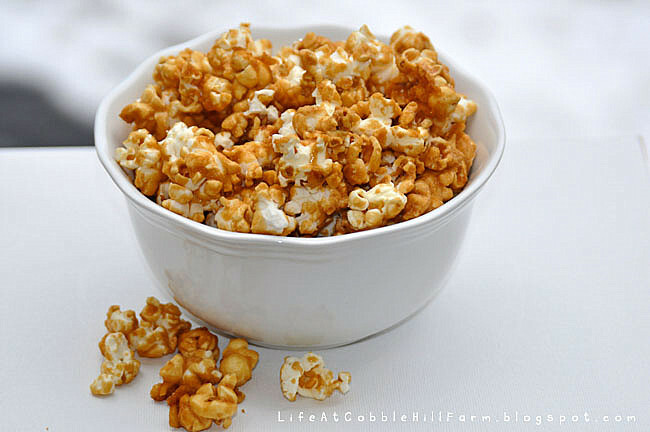 The maple-sugar-syrup bakes into the popcorn and makes it absolutely crunchy and delicious. It's the perfect blend of sweet and salty. I made 2 small changes - I used granulated sugar rather than raw sugar and I added salted peanuts. To get the recipe, visit Alana Chernila's blog here. Oh, I've gotta try this one! Thanks! This sounds scrumtious. It reminds me of Cracker Jacks. Espeically with the peanuts.